What is the benefit of ultrasound simulation? Simulation should give access to individual training. 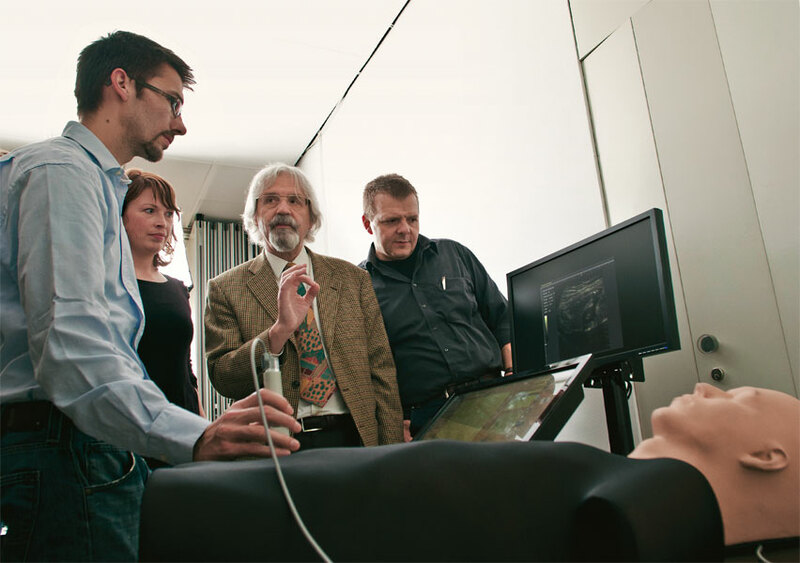 Increase individual training time from minutes to hours in an ultrasound course by simulation! 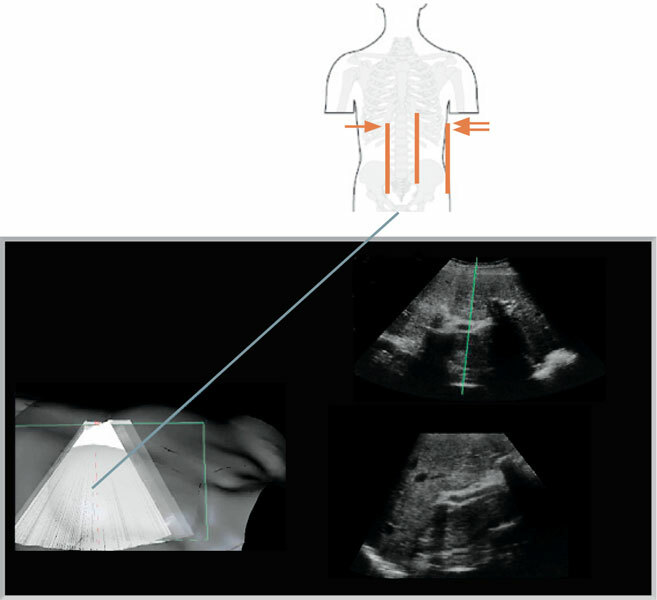 Use reproducible training content, as real ultrasound patient data, which are documented and marked with regions of interest (3D marker). Keep knowledge and teaching agenda in the simulator. 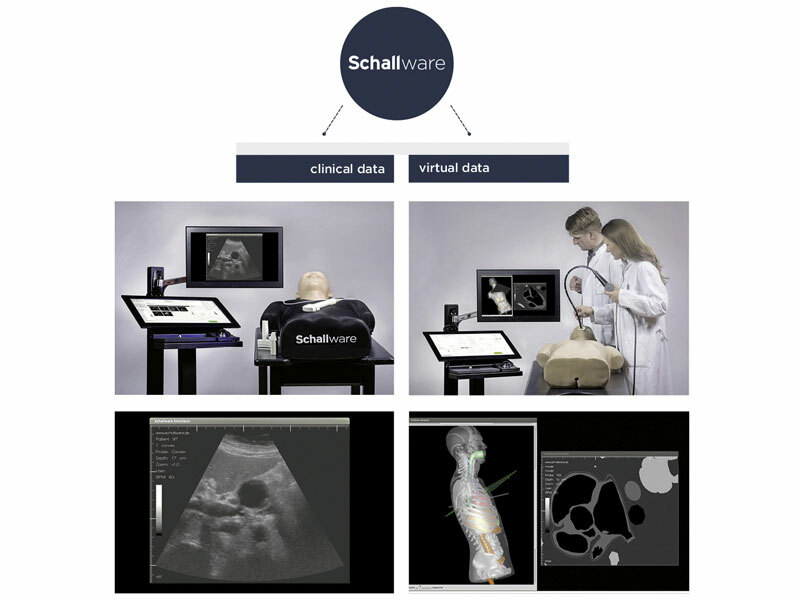 Schallware simulator allows to picture your curriculum into the simulator with real ultrasound data of 500 patients, virtual models and software features as ‘instructions’ (step-by-step tutorials with virtual model and real cases), ‘Question&Answers’ to evaluate/train guidelines (department specific competences) and ‘courses’ (selection of patients) to perform real examinations with assistance of tutors. How to measure educational benefit and output of a simulator? The impact of a simulator system is the number of available lesson hours. A virtual model does not challenge a long time as real cases do not miss details, causes and relationships. Schallware simulator offers over 500 real patients (multimorbid). There are also virtual models which can be used to create teaching tools as ‘instructions’ or ‘Q&A’. of an animated heart, foetus or abdomen are available for continuous scanning around organs to help beginners better understand the body’s anatomy. The Schallware Ultrasound Simulator allows your doctors to practice ultrasound diagnosis congruent with real conditions. Moving the tracked probe over the torso produces an exact B-mode image of the case chosen. In each module, the simulator offers a set of patients. Every one of these is represented by several 3D volumes, or more precisely six abdominal and two intercostal volumes (also see red lines in pictogram). When using the multi-volume mode, all these scans are available. To facilitate this we have acquired data of single patients’ entire abdomens, averaging around 6000 images per patient. The Schallware Pathology Database spans the fields of internal medicine, cardiology, obstetrics and gynaecology. You currently have access to 250 cases in internal medicine, 200 in obstetrics and gynaecology and about 60 in cardiology. For some simulated patients, additional data has been acquired showing differing characteristics such as varying dates, sources (colour doppler or linear probe (8 MHz)) etc. All documented cases include a medical history, questions leading to a diagnosis, comments on ultrasound diagnosis (i.e. what is visible with the simulator) and a pathological description. The simulator enables you to find physiological or pathological structures using regions of interest (ROI). More than 6000 ROIs have already been defined and you can add new ones if you wish. 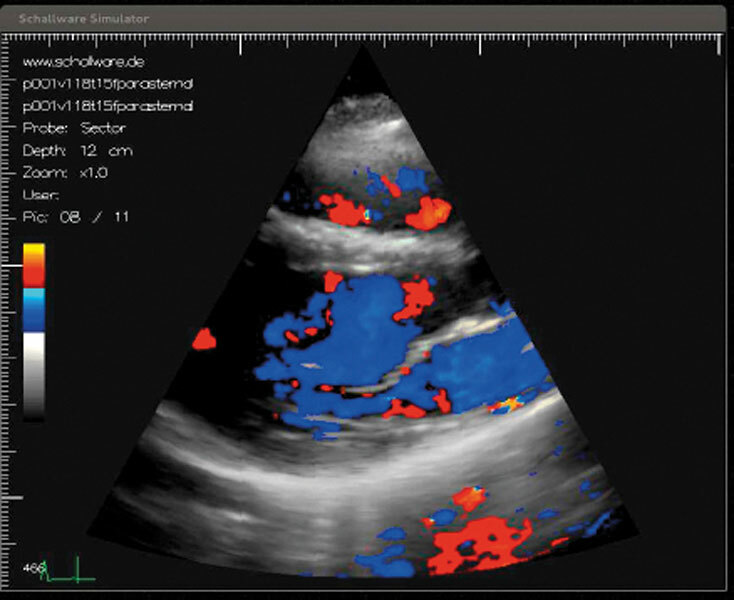 You can additionally take advantage of the simulator as an ultrasound device using a login mode for studies, measurements, storing of freeze-frame images, creating pdf reports or writing questions and answers for tutorials or examinations in a QnA format. Volume representation is based on the clinical data from real patients. 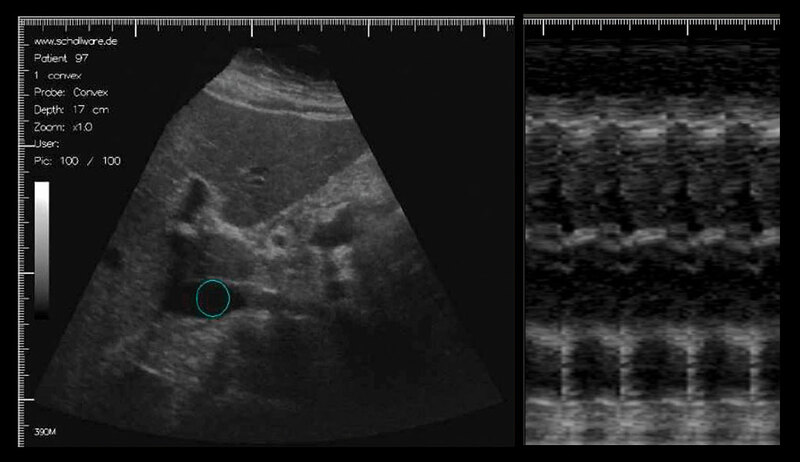 The light area shows a fan volume of a right side intercostal scan. Reconstructed plane shows volume quality (green line). There is a list of ROIs available which directs you to images of related structures. For use in question-and-answers scripts (Q&A), our system enables you to create additional ROIs that can be seen as circular marks on the image concerned. Provide your doctors with a revolutionary, easy-to-use system for hands-on practice in ultrasound diagnosis. 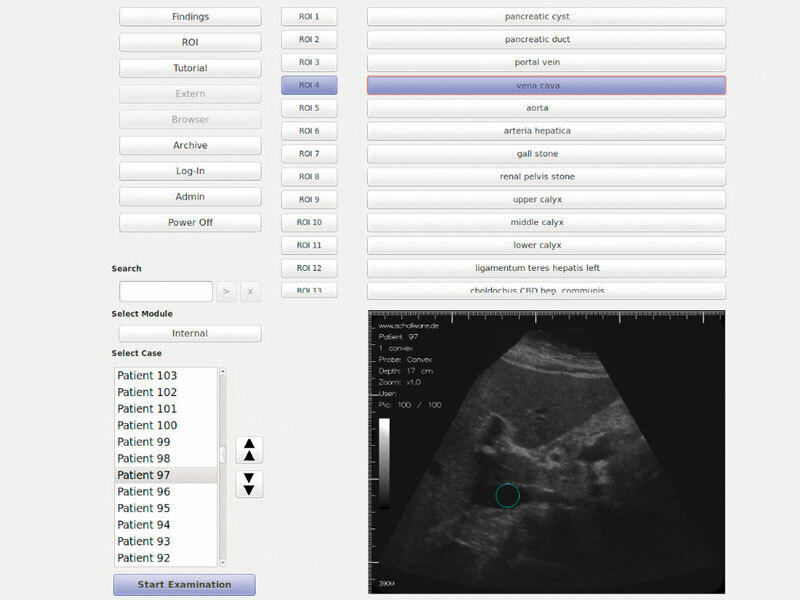 The Schallware Ultrasound Simulator provides the most comprehensive pathology database of simulated patients (500 in 2017) based on clinical data acquired in the form of individual original ultrasound modi. The representation of authentic pathological cases via our simulator enables you to perform teaching sessions for advanced physicians which can be repeated. You have the choice between providing a range of patients in a Q&A format, as a test with scores or simply a tutorial. Even self-study is feasible facilitated by image documentation of regions of interests (ROI) which automatically lead you to interesting physiological and pathological structures. Data relating to some patients has been acquired at several stages of their treatment, using either B mode, colour doppler or linear high frequency probes. 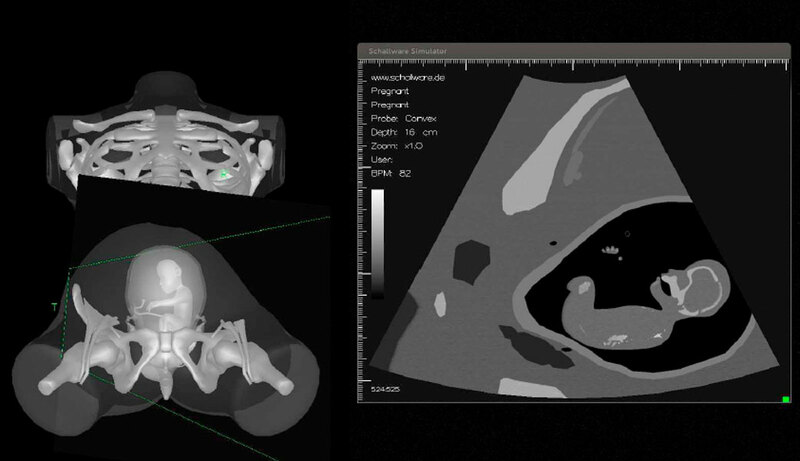 We also offer virtual data models of an animated foetus, heart and abdomen to enable beginners to study their anatomy. The scanned data is organized into thematic modules which range in levels of difficulty from beginner to advanced. Our system consisting of three dummy torsi and five dummy probes covers ultrasound diagnosis scenarios for the fields of internal medicine, emergencies, cardiology and gynaecology. 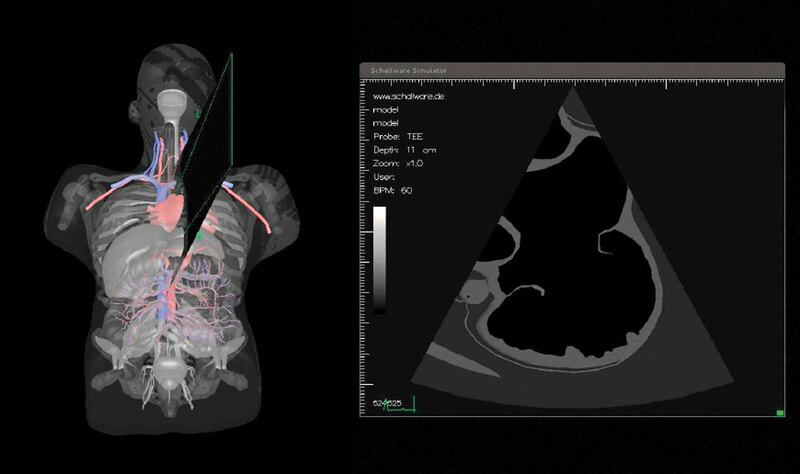 Our Core System includes one dummy torso, three modules and corresponding probes. Various add-on modules are available from our ever-growing library, produced by our affiliated clinics. Each module includes up to twelve documented patient cases. Ensure consistent quality and knowledge by allowing doctors to regularly revisit documented cases at any time. With the use of our Simulator, your doctors can now regularly practice ultrasound diagnosis on both common cases and those which may only arise once a year. Doctors can test their knowledge by comparing their diagnosis to the documentation that comes with each module. In such a way, the simulator serves as a reference for your clinic, being available at any time. Providing these consistently accessible training and reference resources to your doctors sets a consistent quality standard in ultrasound diagnosis throughout your clinic. 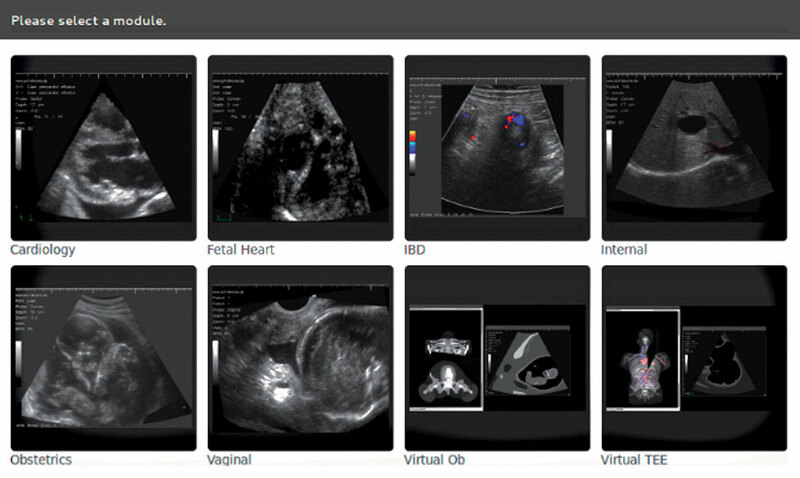 Using our Schallware ultrasound simulator, you benefit from a huge case database. Schallware has developed its own recording technique (3D freehand). We run several acquisition labs that source data from affiliated clinics. The efficiency of our database continues to increase year by year. What distinguishes us from our competitors is the case quality, all of which reflects original ultrasound data – not virtual-world cartoon style. Our high-resolution simulator data covers both abdomen and flanks and every case is recorded with its own volumes. 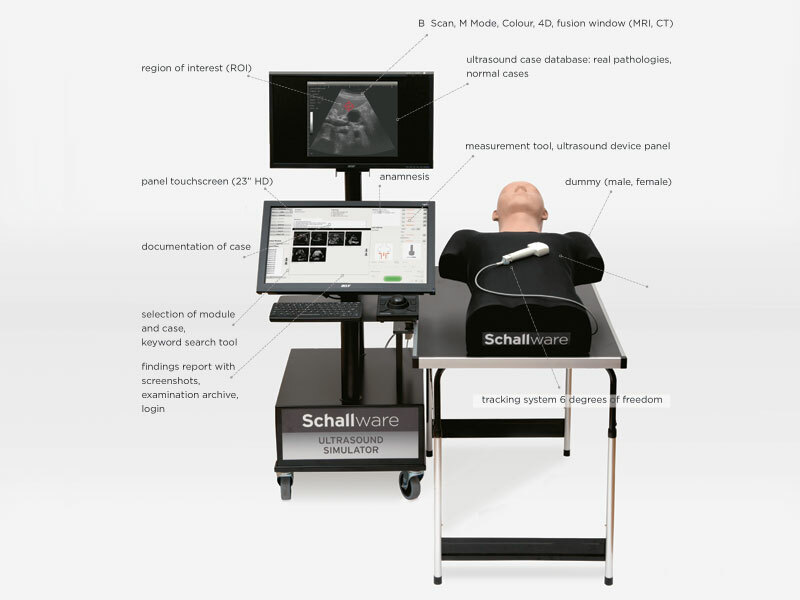 The Schallware ultrasound simulator provides different components to support ultrasound training. It starts with idealization on virtual models for the heart, large vessels, organs and fetus development of 12th and 20th week of gestation. To achieve first ultrasound competences there are instructions available which help to find, assess and measure regions of interest. Of course, you can make up your own instructions. In addition, you can define complex QnA scripts (Question and Answer scripts figure out strategy of examination). It is a sequence of questions with one or several ultrasound volumes. You can run such QnAs as a tutorial with prompt explanation, scored examinations (log-in studies) with pdf-reporting for any user. For advanced users there are predefined courses for all departments available. These courses allow practicing of real patient casuistries (multimorbid) on simulator. Patients are acquired for whole abdomen in up to 9 volumes.The schallware pathology database offers rare and seldom cases, therapy control acquisitions over months, contrast sequence acquisitions and additional data as MRI, CT.